Work and energy are quite interlinked. If we have energy, we can do work and if you doing work means you are using your energy. Energy at basic level in mechanics is in two forms called potential energy and kinetic energy. Potential energy is possessed by the body by virtue of its position and state. Kinetic energy is possessed by the body by virtue of its motion. The sum of these two energies is called mechanical energy and it is constant when there is no loss of energy in any format. 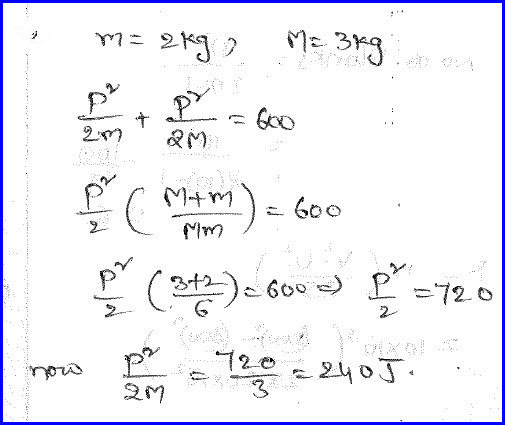 We can also find the relation between kinetic energy and momentum. It is given in the problem that a three dimensional block of known dimensions and mass is on a horizontal floor. It is standing on the floor with size of minimum on the floor and we need to measure what is the work done in changing its position such that largest dimension is on the floor. The problem is as shown in the diagram below. In each state, one size is on the floor and hence it possess potential energy due to the height that the surface has from the ground. When we change the position, the height from the ground is changed and hence it has different potential energy. We need to measure the potential energy in each case and the difference between them is the work done in this case. The solution is as shown in the diagram below. It is given in the problem that a liquid of known specific gravity is flowing in a pipe line with a speed 2 meter per second. We need to measure the kinetic energy per cubic meter. The problem is as shown in the diagram below. 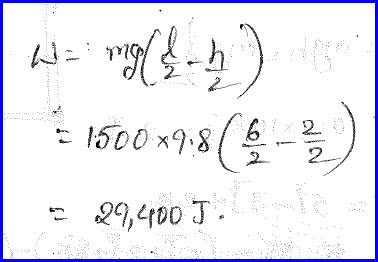 Specific gravity is the ratio of density of the body with the density of water. When we need to measure the kinetic energy per unit volume, we need to divide the kinetic energy with the volume. Then it becomes half of density and velocity square. Density of the liquid is 800 kilogram per meter cube. Thus we can solve the problem and the answer is 1600 joule. It is given in the problem that the kinetic energy of the freely falling body is given as a variable of time. We need to measure the weight of the body and the problem is as shown in the diagram below. As the body is falling freely, its initial velocity is zero and it acquire the velocity and it can be found using the first equation of motion. 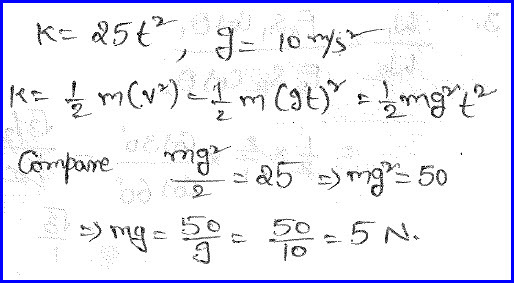 Thus we can measure the kinetic energy in terms of time as shown below. 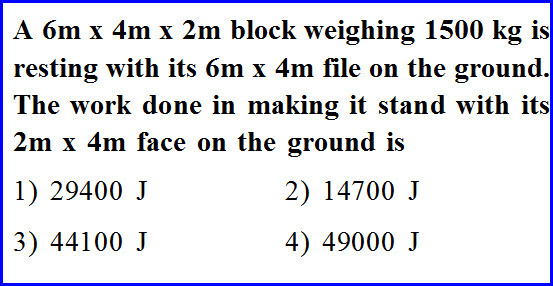 By comparing it with the basic equation we can find the value with at unit time thus weight can be found as shown below. If kinetic energy of a body is increased by three hundred percent, we need to know by how much percent momentum of the body changes by. The problem is as shown in the diagram below. We know that kinetic energy is proportional to square of momentum. By increasing the kinetic energy by 300 percent, the total kinetic energy will be 400 percent and it will be four times of initial kinetic energy. Thus we can measure the change in momentum as shown in the diagram below. A bomb is initially at test and it explodes into two pieces of masses 3 kilogram and two kilogram. The total kinetic energy of the explosion is given to us as 600 joule and we need to measure the kinetic energy of heavier piece. The problem is as shown in the diagram below. As there is no external force acting on the system, linear momentum is conserved. 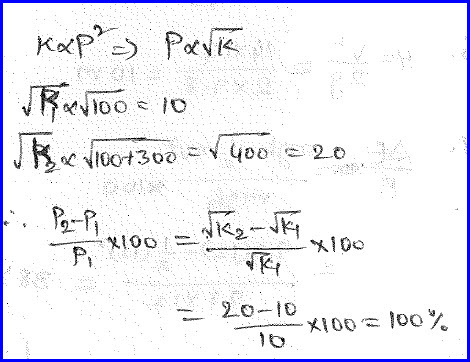 Thus we can find the ratio of their velocities as reverse ratio of their masses. We can express kinetic energy of each one in terms of momentum and the problem can be solved as shown in the diagram below.